We recently asked the BuzzFeed Community to tell us about their favorite affordable beauty products and brands, and here they are! 1. ColourPop Cosmetics delivers luxury beauty by creating amazing products at prices that don't break the bank. Get the Makeup Ur Mind palette for $12 and shop the rest of the line from ColourPop. 2. The British company Makeup Revolution create products extremely fast and delivers high quality products at super affordable prices. Get the Revolution X Soph Extra Spice palette for $15 and shop the rest of the line from Makeup Revolution. 3. E.l.f. makes luxurious, high-quality beauty products that cater to everyone but won't leave you broke. Get the Prep & Blur Stick from Target for $8 and shop the rest of the line from e.l.f. 4. 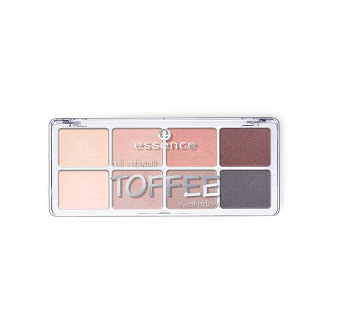 Essence brow gel and eyeshadow palette both give long lasting, bomb results and are super affordable. 5. The Ordinary never tests their skin care products on animals and is never formulated with parabens or sulfates. Plus, they offer a year-long refund policy if you're not satisfied with your results! Basically, trial and error gods! Get the Buffet and Copper Pesticides for $38.15, Buffet for $16.77, and shop the rest of the line from Cult Beauty. 6. Real Techniques offers amazing products for all skin tones and skin types, so you're bound to find something that works for you. Shop the line from Real Techniques. 7. Tea Tree Anti-Imperfection Daily Solution battles breakouts while leaving your skin looking and feeling healthier, purified, clearer, and smoother. "Tea Tree Anti-Imperfection Daily Solution by The Body Shop is amazing! A couple of drops every night, followed by a good moisturizer, cleared up my skin so much. I’ve had hormonal acne since middle school, and the Tea Tree Solution made me confident enough in my skin to forego base makeup most of the time." —Madeline B. Get it from The Body Shop for $15.40. 8. Maybelline Super Stay Full Coverage Foundation is oil-free and lightweight, all while providing maximum coverage that lasts all day. 9. L’Oreal Voluminous Lash Paradise mascara will have your lashes covered in silky volume with just one coat. No re-applying needed here. Get it from Target for $6.49. 10. Milani eyeshadow primer will intensify the color of your eyeshadows while providing lightweight crease-proof coverage — every beauty fiends dream. Get it from Target for $5.99. 11. L.A. Girl Nudes Palette comes with 12 stunning colors to give your eyes a fierce look that will last all day. 12. Maybelline Eye Studio Master Precise Liquid Eyeliner will leave your eyeliner application looking smoother and more even than ever. 13. Rimmel London Bronzer provides a natural and lightweight bronze finish for anyone trying to achieve that sun-kissed glow. Get it from Target for $4.29. 14. Ambi Skincare Fade Cream is perfect for color correction and spot treatment by combining vitamin E, alpha hydroxy acid, and sunscreen. Get it from Target for $4.99. 15. Eve Hansen products provide natural skin care regimens that are not tested on animals and are eco-friendly. Their 60-day return policy is also very lenient, allowing customers to find products that work best for them. Get the 1 oz. Vitamin C Serum from Amazon for $12.99 and shop the rest of the line from Eve Hansen. 16. Plan 36.5 Plant Cell daily masks improve your facial skin condition by using plant stem cell ingredients while protecting your skin from stimulation. Get a pack of 10 masks from Amazon for $9.99. 17. Smith’s Rosebud Salve can be used for chapped skin, smoother lips, moisturizing, and creating that highlight glow. Everyone needs one of these in their bag. 18. And Neutrogena Hydro Boost Gel-Cream helps quench extra-dry skin and keeps it looking smooth, supple, and hydrated day to day. Get it from Target for $16.19.